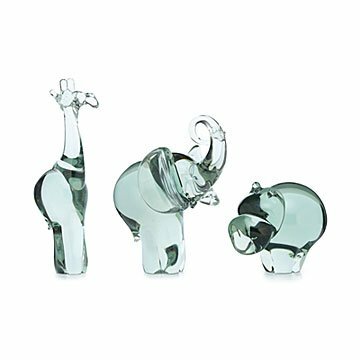 African artisans handcraft this slender giraffe, belly-flopped elephant, and hippo from recycled glass. Sitting down to your desk each morning makes you smile. Why? It's not that inbox full of emails—it's these adorable glass friends. They keep you company as you work and remind you to keep a childhood sense of wonder. The slender giraffe, belly-flopped elephant, and chubby hippo are all handblown from recycled wine bottles by artisans in Swaziland. They use an age-old glass blowing technique to create the traditional African animals. When you buy them—whether as a gift or for your own home—you're supporting fair, meaningful work for deserving people. Handmade in Swaziland, Africa.